This may not be Android-related yet, but you can bet it will be before long. 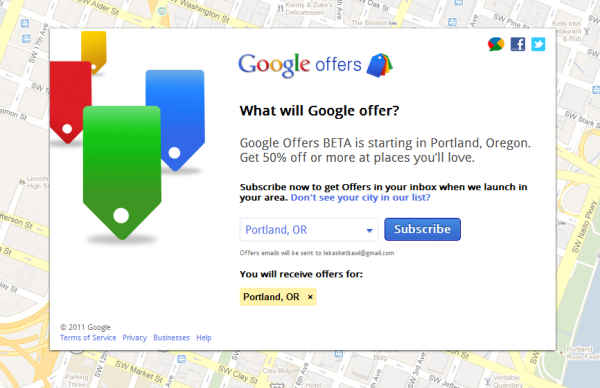 Yep, Google activated their new Google Offers program today which will be similar (or exactly the same) to the services offered by companies like Groupon and Living Social. A 1-day deal on a product or service for a fraction of its original price is the scheme, and my fine friends in Portland, Oregon get to experience it all first. Assuming the beta test here in P-town takes off, the plan is for Google to expend to NYC and then the Bay Area. And when I say that it’s not Android-related “yet,” that’s because we’re assuming it’ll only be a matter of weeks before an update to Google Maps goes live with Google Offers integration. Or maybe even a Google Offers stand-alone app? It only makes sense. More DROID Incredble 2 Cases Arrive at Verizon Stores, No Longer Expecting an Announcement?